After ‘The Dirty Picture’ the buzz around Vidya Balan has grown ten fold. I don’t think there was ever a best phase in her career when people are more interested in knowing more about her and her upcoming projects. In the same wave another master stroke performance has been delivered by her in the latest release KAHAANI. I went with a lot of expectations to see Kahaani as now I consider Vidya as equal to Aamir Khan after the spate of well made and well performed movies that we saw in the last 3 years starting from Paa, Ishqiya, No One Killed Jessica, The Dirty Picture and now Kahaani. I was not disappointed a bit as my expectations were fulfilled and I loved every minute of the movie. The story is about a pregnant woman’s search for her missing husband. In her search she is helped by a newly recruited policeman Rana (Parambrata Chattopadhyay). This thriller comes up trumps in the climax when the real mystery and story unfolds, who is Vidya Bagchi, does Arnab Bagchi exist in real life? Or it is all a story aka Kahaani narrated by Vidya? You have to see the movie to find out the same as revealing anything further will be spoiling the fun of watching such a fast paced thriller. 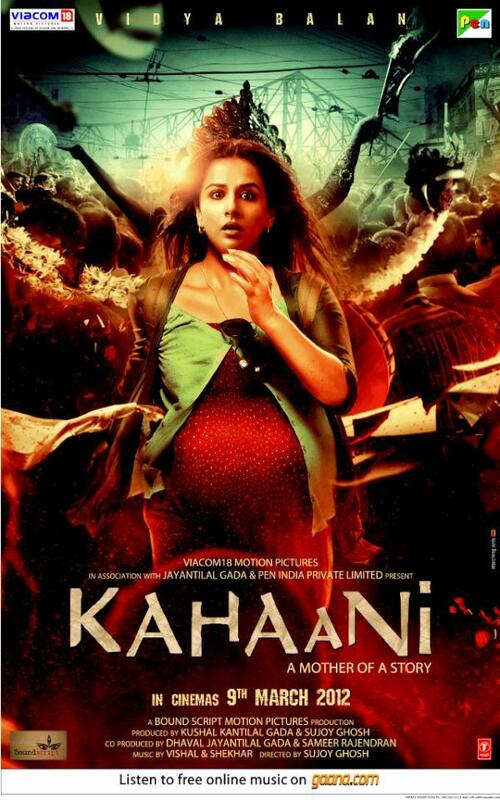 Kahaani has a very simple story with a lot of twists and turns written by Advaita Kala and Sujoy Ghosh. The screenplay by Sujoy, Suresh Nair and Nikhil Vyas is superb and at no point do you get any time to think or feel bored. The performances are first rate, the director has seen to it that no one in the movie is wasted and therefore even a small part played by the two kids and the actress who plays the role of Agnes is also well written and performed. However the entire movie rests on Vidya Balan who comes up with another award winning performance. I especially loved her in the climax, can’t reveal the scene or anything about the climax, so I am just holding onto it. The music by Vishal-Shekhar is good and goes perfectly with the mood of the movie. Kolkatta has never looked so beautiful and the entire credit goes to Cinematographer Sethu and the editing by Namrata is another high point. The background score is gripping and on a whole I would say this is a ‘Must See’ movie for everyone. At last Sujoy Ghosh gets back his mojo after back to back flops like Home Delivery and Aladin. Go for it!